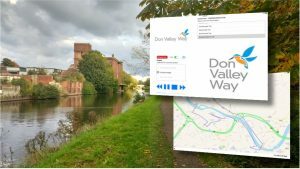 The Don Valley Way audio guide app will guide you around nine heritage walks, taking you on circular walks linking with the main Don Valley Way route. Your audio guide will give you directions around the walk and interesting historical information about the area. Individuals and local history groups were recruited to devise walks. The volunteers researched and wrote scripts for the nine trails* before Audio Trails were brought in to test the routes and provide advice on walking directions to guide visitors from one stop to the next. Audio Trails were also commissioned to record the volunteers reading using our mobile recording studio. Over two days the Servants Hall at St Catherine’s House in Balby Doncaster was our home. Following the recording Audio Trails edited the audio, added sound effects and ambient background music. The nine audio trails are available from donvalleyway.org.uk and embedded within our ‘Listen’ GPS-enabled audio tour guide iOS and Android software. “Overall we found the process of working with Audio Trails very easy. After we had drafted our walks and scripts, Dan tested them out, made suggestions and provided us with gpx map routes, which was very helpful as we did not have the equipment ourselves. The recording process ran incredibly smoothly thanks to Dan’s mobile studio. I thought I had booked a very quiet room, but it turned out that there were a lot of bumps and creaks coming from other parts of the building – Dan was very patient throughout, skilfully guided our volunteers through the process and got rid of any ‘gremlins’ from the recordings. To say we were using unexperienced volunteers for the recording, we were incredibly impressed with the final quality of the recordings. * The trails explore Doncaster, Sprotbrough, the Don Gorge, Conisbrough, Swinton, Mexborough, Rotherham (x2) & the Kelham Island area of Sheffield.